Yalin Ozucelik and Danielle Carter. Photo: Prudence Upton. For the snide critic to rip into Alan Ayckbourn’s TV-style sit-coms is as easy as shooting ducks on a pond. But that is to miss many skilful subtleties, most notably the shrewd plotting of his plays, brilliantly exemplified by the 45-year-old trilogy known as The Norman Conquests. The interaction between six characters across a weekend is set in a different room of a house or in its garden in each play, so the off-stage action in one becomes the on-stage action in the other two. Ayckbourn insists there’s no correct order in which to see the plays (which also function as stand-alone pieces), although I think Table Manners the ideal opener, thanks to a piece of plotting prosaically necessitated by the unavailability of the actor playing Norman during the original production’s early rehearsals. Ayckbourn’s pragmatic solution was to write Norman out of the first half hour, resulting in a mounting dramatic tension as the rest of the cast discusses and disparages this titular character whom we grow ever more eager to encounter. When he does finally appear, Yalin Ozucelik’s Norman lights a firecracker in the production’s midst. If he’s not quite on a New Year’s Eve scale, he’s enough of a sparkler not only for Ruth (his wife – Rachel Gordon), but also Annie (Ruth’s younger sister – Matilda Ridgway) and Sarah (sister-in-law to the others – Danielle Carter) credibly to entertain sharing a bed with him. Yalin Ozucelik, Brian Meegan and Danielle Carter. Photo: Prudence Upton. Under Mark Kilmurry’s direction Ozucelik makes Norman (who has many of the wittiest lines) roguish, eccentric, likable, comical and, crucially, an innocent rather than a predator. Ozucelik’s performance is vital, Norman being the axle of a wheel that has Sarah, Annie and Ruth as spokes, and Sarah’s husband Reg (Brian Meegan) and Annie’s dormant beau, Tom (Sam O’Sullivan) as its rim. Ayckbourn’s clever plotting also includes the siblings’ unseen, bed-ridden mother looming over the action like a malevolent spirit from upstairs. Every playwright is like a little god who peeps down from the flies and manipulates his or her characters with varying levels of beneficence or malice. 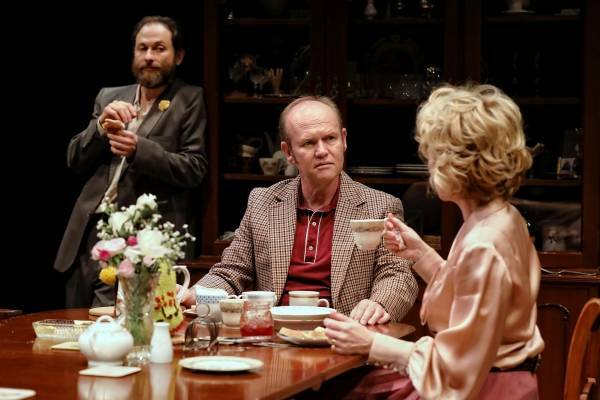 Here you feel Ayckbourn’s benignity like a warm breeze wafting through the play: an unmistakable affection for his sextet, despite their varied, glaring foibles. If Carter’s Sarah borders on being too arch, both the actor and character may be forgiven, because she has to cope with being married to the wisecracking, maddeningly ineffectual Reg, whom Meeghan makes wetter than I’d imagined, perhaps because he’s been trampled on by his control-freak wife for a decade. In the ineffectuality stakes Tom leaves Reg for dead, and at first I thought O’Sullivan’s rendering was too cartoonish, yet ultimately he makes him likable as well as pathetic – sufficiently for it to be vaguely credible that Ridgway’s feisty Annie should still hold a flickering candle for him. Annie has the comedy’s one genuinely moving moment when she smashes some breakfast crockery as an alternative to smashing assorted heads, including her own. Gordon’s Ruth is the least three-dimensional character, although she should come more into focus in the trilogy’s Living Together and Round and Round the Garden. Each play contains a kind of virtuoso comic set-piece, and in Table Manners it’s Sarah’s seating plan for dinner going so awry as to turn to mud a meal for which she had such high hopes. 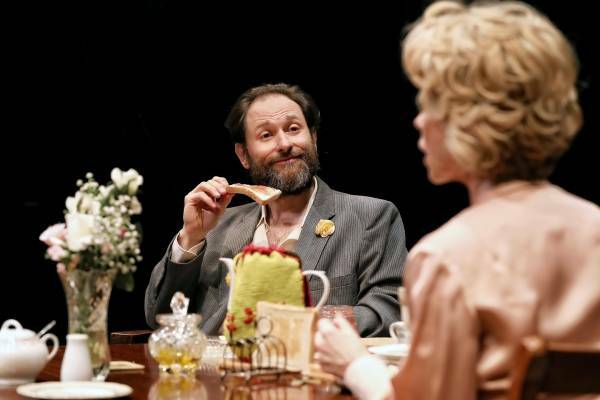 But then Ayckbourn’s gentle satire is about what actually happens while people are busy hoping, whether in the 1970s England that Kilmurry and designer Hugh O’Connor have maintained, or now. The Norman Conquests: until January 12.